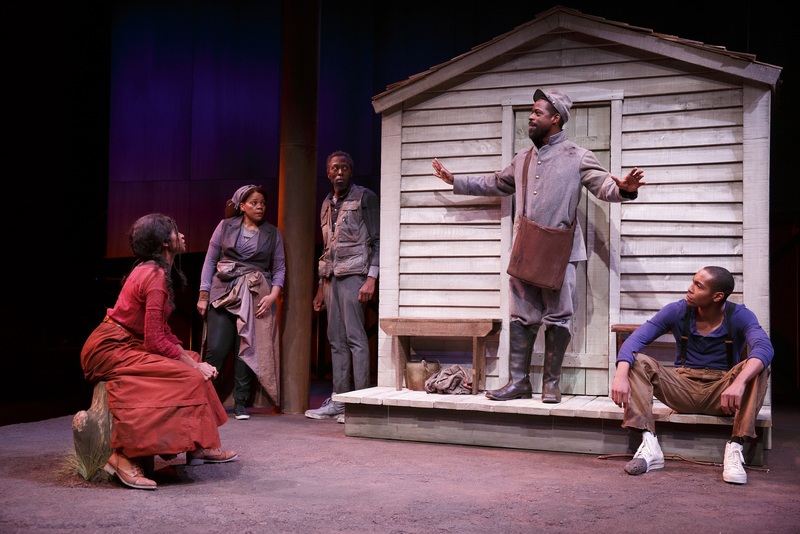 The hero of of Suzan-Lori Parks’ new trilogy of plays, Father Comes Home From the Wars, is Hero (Sterling K. Brown), a slave on a small Texas plantation at the cusp of the Civil War. He has the makings of a hero in both character and physique– a tall, strong, young man with industrious energy and an acute sense of responsibility to his community. And yet, Hero’s heroism wavers precariously throughout the trilogy, which sees Hero off to fight alongside his master in the Confederate army and make good on his promise to return to his friends, family, and almost wife Penny (Jenny Jules). Parks’ play, the first of three planned trilogies reflecting on race and freedom in America, evokes classical tragic structures and dynamically modernizes them for contemporary audiences. There’s a chorus comprised of four “less than desirable slaves” on Hero’s plantation. There’s a character named Homer, another named Ulysses, and Penny surely fills in for the faithful Penelope. 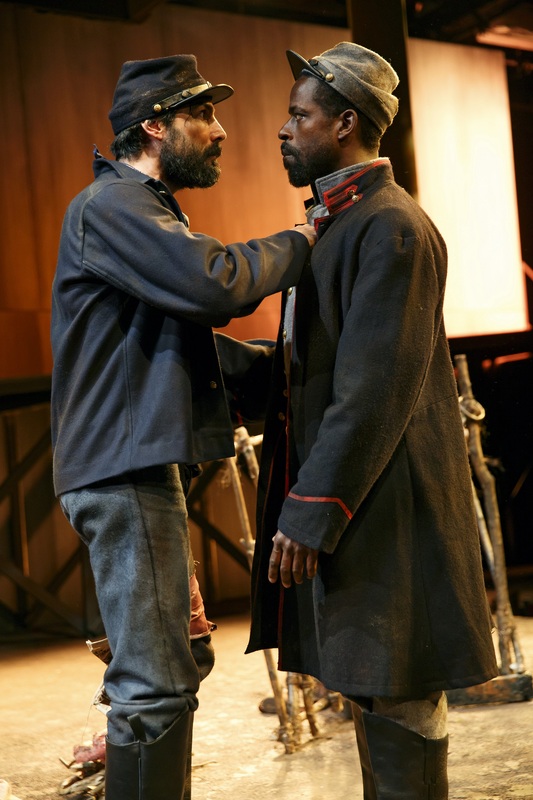 The first and third parts most closely stick to the verse style of ancient theater, the second part veering off dramatically in structure for an intense and fascinating confrontation between Hero, his drunk, maniacal master, and a captured Union soldier with outspoken feverish ideas about the worth of black men in America. The Public’s Anspacher Theater makes the perfect home for this trilogy; its grecian columns flank a marble balcony and make the stage feel like a ancient temple. Parks’ Hero faces many of the same ideological struggles as his classical counterparts. The first part is especially valuable as a study of a man raised in the institution of slavery, who knows nothing else beside it, and who is suddenly being asked to rebel against all he has ever known with only the hope of an unsure future of freedom ahead of him. Hero turns on his friends and family in his cowardice, he is repeatedly complicit in his master’s tyrannical rule, and he proves gullible for his master’s empty promises. Hero is no hero, but he is human, and it is truly cathartic to see Hero’s fearful honesty processed. The second part is a more intellectual study of the condition of slavery and the psychologies produced in master, slave, and outsider. It’s a climactic and stimulating scene. It flashes in lightning speed and its insight comes like stormy gust of wind. The third part is by far the weakest point of the trilogy, a little contrived and too slowly paced, but it looks at freedom with new perspective, particularly for the play’s only main female character Penny. Sterling K. Brown is a judicious and intuitive Hero. He is steadily reliable as the emotional center for the play, and his restraint is made all the more important when Hero’s pain present itself. The chorus actors, Russell G. Jones, Julian Rozzel Jr., Tonye Patano, and Jacob Ming-Trent, make for a diverse and lively group. As Hero’s master, Ken Marks is delightfully unpredictable and focused, and Louis Cancelmi is a moving portrait of hope for our disillusioned protagonist.